Target creature gets +2/+2 until end of turn. 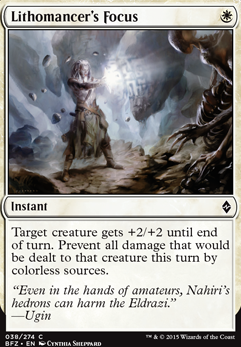 Prevent all damage that would be dealt to that creature this turn by colorless sources. I am actually thinking that the copter might be replaced by Metallic Mimic, Selfless Spirit, or Aethersphere Harvester. With Spirit and Mimic, I can keep the card slot at 2 cmc and have either a strong utility flier or another human synergy card that causes Hanweir Garrison and Thalia's Lieutenant to be even stronger (misread mimic, he does place counters even if they don't start with one). The Harvester is a nice new vehicle I am considering because it brings enough energy to power its lifelink for 2 turns, has good stats, and (like copter) has a crew requirement of only 1. I am currently leaning towards the mimic because the cost($) of card will be cheaper and fits the human theme well, but I think the spirit will benefit the deck more. Still more to consider before I make the final decision. Sorry Kataclysm about the misread and turn down of mimic at first. 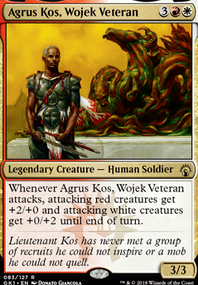 Now that I have read him properly I see him as a good options for the deck. As for the Thalia suggestion, I have been trying to get her for a while but the stores I go to have been sold out of her for months. I would like 2 copies for the side or even possible to get in the main. Currently looking at the side and thinking I need to make some serious tweaks to get ready for ceratin decks and combos. 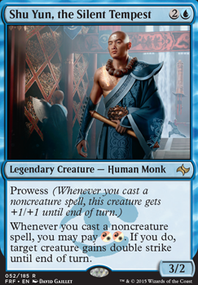 Currently the deck has no answer for the Saheeli Rai/Felidar Guardian combo and I know the people at my shop are already jumping on the idea of using this trick. My plans for countering it will be Thalia, Shock, and Authority of the Consuls. Thalia and consuls stop it the combo in the same way by tapping the creatures as they enter denying them an attack. Consuls takes it a step further by making sure they don't use an untap card and still kill me, because I will gain 1 life for each creature they bring in. 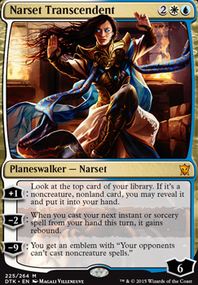 The card shock can interrupt the combo as they start it to kill Saheeli as she activates to spawn the first token. These cards being brought into deck still need some time to decide what might make it to main deck or which card to replace in the side. 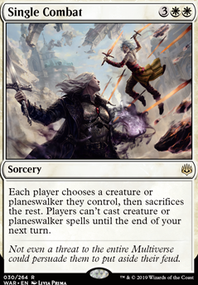 Cards on the potential cut list are Lithomancer's Focus, Repel the Abominable, Skywhaler's Shot. Feel free to let me know what you think about these ideas. All comments and suggestion are welcomed. Actual deck changes to main deck coming next week since we have one more FNM to enjoy our copters. Kinda glad to see them go but sad since I just got the number I liked in deck. Running 4 Blossoming Defense, 4 Lithomancer's Focus and 2 Built to Last. Ornamental Courage doesn't give enough power to make Lone Rider Flip do 3 damage, so that I gain 3 life and it transformers. Just a reminder that Titan's Strength is rotating out with Origins. Like the deck idea otherwise. Lithomancer's Focus is a potential replacement that is decent pump and is good vs Eldrazi and artifacts creatures. So I (finally) pulled together a list of cards that play well with Zada and Mirrorwing. Dazzling Reflection: Life-gain? Who knew? Saheeli's Artistry: Mode 2 = Wow! Please let me know of any I missed!